The Minimum Energy Efficiency Standard takes effect on 1 April 2018. Landlords, are you ready? From 1st April 2018, it will be unlawful for landlords to grant a lease extension, renewal or new lease for business and residential properties that do not reach a Minimum Energy Efficiency Standard (MEES) of an EPC rating of E or above. Landlords should act now, if they are not already, to avoid the financial and reputational penalties for non-compliance. The MEES regulations apply to properties rented in England and Wales only, where EPC F and G rated properties are being referred to as ‘sub-standard’ in Government documents. An EPC must be recertified every 10 years anyway, and there is a backstop date for all tenancies from 1 April 2023, when landlords must not continue to let a sub-standard property even to an existing tenant after this date. If a building is not considered a “dwelling” it is de facto a non-domestic building. Worryingly, 18% of the non-domestic stock is F or G rated, which equates to approximately 200,000 buildings or 150 million square metres. 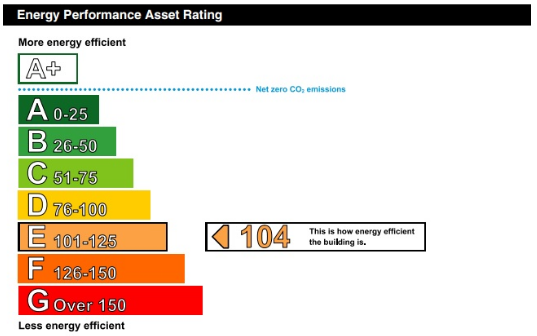 For non-domestic buildings, the EPC scale is based on an Asset Rating. Asset Ratings are based on CO2 emissions from the building compared to the Standard Emission Rate, with an improvement factor of 23.5% applied. The reference building is essentially the 2006 Part L2A compliant building which will always get an Asset Rating of 50, equivalent to a B/C rating. A building built to minimum 2013 Part L2A regulations should achieve an Asset Rating of approx. 34, or a B rating. Exemptions must be recorded on the public “Exemptions Register” and last for five years only. It’s worth noting that exemptions cannot be passed onto a new owner if the property is sold. A property could be exempt if it is not required to have an EPC (under the Energy Performance of Buildings Directive 2007). An exemption may be granted if an independent surveyor (on the RICS register of valuers) confirms via a report that the energy efficiency measures would reduce the market value by five per cent or more. The property could be exempt where the energy efficiency measure would not meet the seven year payback test (using the Government’s methodology and approved software SBEM/DSM). If an exemption is being sought because a third party consent is required to make the improvements and demonstrably withheld, ‘reasonable efforts’ must be made and documented. Other valid exemptions include where a landlord has made all the relevant energy efficiency improvements to the property that can be made, and it remains at an F/G rating, or it would be detrimental to the building fabric; and written confirmation is only valid from a chartered Architect, Surveyor, Engineer, or a demonstrably qualified independent expert, such as a sustainability consultant. Every Local Weights and Measures Authority is the “enforcement authority”. An enforcement authority will check whether the property is sub-standard (and after 1st April 2023, whether the landlord continued to let the property), whether the landlord has registered any false or misleading information on the PRS Exemptions Register, or failed to comply with a compliance notice. An enforcement authority may serve a compliance notice on a landlord up to 12 months after the suspected breach. The penalties for non-compliance increase in scale with the length of the breach: For up to three months non-compliance, the maximum penalty is £50,000. For three months or more in breach, the penalty is up to 20% of rateable value, with a maximum penalty of £150,000. Submission of misleading or false information may incur a fixed fine. As the MEES comes into effect, F and G rated “substandard” buildings will most likely see their marketability and value affected. So, what should landlords do? Carry out energy assessments to check whether the EPC ratings are correct, identify synergies between improvement measures and undertake the most cost-effective interventions, in the least intrusive manner for occupants. Having encountered a spectrum of awareness levels amongst landlords to date, the sustainability consultancy Eight Associates is running a MEES clinic, offering landlords a free confidential MEES consultation about their options for achieving compliance. One of the first questions any landlord should ask is when did the building last have an EPC. These are valid for a maximum of 10 years. Some landlords have been surprised to learn that getting a good EPC rating is partly down to good energy efficiency measures, and partly knowing how the methodologies underpin compliance work. In Eight Associates’ experience, SAP, and to a lesser extent SBEM, are poor tools for assessing real life energy consumption due to their simplicity. Landlords should ensure their energy assessors really understand the methodology, rather than rely on default inputs, to provide useful data for the payback calculation and investment appraisal. For example, Eight Associates worked on a warehouse that had a gas radiant heater installed that was never used because it was dilapidated. By virtue of it being installed, the software assumed a consumption pattern. Just removing the heating system from the calculations would improve the building from a low G rating to a D rating. Check when the building last had a fit out. A ‘sub-standard’ building with an F or G rating is very unlikely to have undergone any renovation or replacement for a long time. As a rough ‘rule of thumb’, if a non-domestic building has had some appropriate level of fit-out in the last 10 years, then it should be on track to achieve an EPC E rating or above. Non-domestic interventions could range from a fabric upgrade and draught proofing and secondary glazing, to installing a gas boiler and LED lighting. What HVAC and lighting solutions are in place? For example, a non-domestic building that has a basic fluorescent lighting or better, should be performing better than F or G rating, unless there are compounding issues, such as a terrible ventilation system. Does your building use gas? Given the non-domestic EPC rating is dependent on CO2 emissions, a building with a gas boiler may well comply. Not only does electricity cost more than gas, it is also more carbon intensive: Gas has a carbon intensity of 0.216 gCO2/kWh compared to that of electricity, 0.519 gCO2/kWh. However, the building regulations’ carbon factors will be changing in the next release of the regulations. Electricity has dropped CO2 intensity by over 20% in the last few years because of the UK’s very successful deployment of renewables, and the current consultation is proposing 0.208 gCO2/kWh for gas and 0.398 gCO2/kWh for electricity. Such changes to the carbon factors will have huge implications for modelling and compliance. For example, it will completely change the viability of heat pumps versus CHP. Potentially, re-running the energy models with the new CO2 factors could move many electrically powered buildings up an entire EPC band. Eight Associates’ expertise in providing portfolio-wide carbon and energy-saving advice means we can conduct energy assessments and up-to-date EPCs, advise on the upgrades available, with informed pay-back calculations, devise the most cost-effective energy efficiency strategy to close the gap and verify improvement works and provide new EPCs to demonstrate compliance. A top tip is to be aware that F and G rated EPCs could be a combination of poor building and poor modelling, so ensure that the calculations are done in full to get the best result. This means calculating fan powers, condenser efficiencies and lighting power in full detail to get the best result. It is worth it; Eight Associates was asked by a client to improve their EPC low ‘D’ rating on their 3000 square metre office, and this was improved to a C rating without any improvements, just by modelling the full detail. With such a tight window to comply, landlords can book a free consultation to help understand their options with Eight Associates. Please ring 020 7043 0418 or email info@eightassociates.co.uk to book a free initial consultation.